A beautiful hardback gift to treasure. 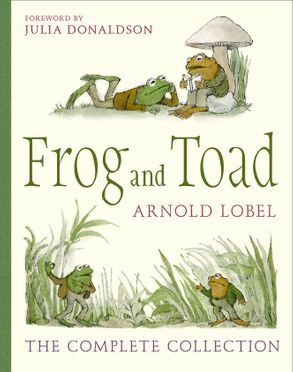 This collection brings together all of Arnold Lobel's engaging, warm and funny stories about Frog and Toad, and features a special foreword by Julia Donaldson. A collectable classic treasury that every child should read and own. Julia Donaldson says “I hugely admire and envy Arnold Lobel; he is my hero”. From writing letters to going swimming, telling stories to finding lost buttons, Frog and Toad are always there for each other – just as best friends should be. The Frog and Toad stories from Arnold Lobel have been loved by generations. This beautiful treasury brings together all twenty stories from Frog and Toad Are Friends, Frog and Toad All Year, Frog and Toad Together and Days With Frog and Toad. Arnold Lobel was the award-winning author and illustrator of many beloved children’s books, including the classic I Can Read Books about Frog and Toad, and Uncle Elephant.